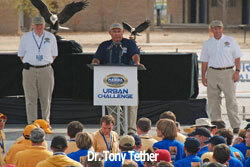 The DARPA Urban Challenge was held on November 3, 2007, at the former George AFB in Victorville, Calif. Building on the success of the 2004 and 2005 Grand Challenges, this event required teams to build an autonomous vehicle capable of driving in traffic, performing complex maneuvers such as merging, passing, parking and negotiating intersections. This event was truly groundbreaking as the first time autonomous vehicles have interacted with both manned and unmanned vehicle traffic in an urban environment. Teams from around the world were whittled down through a series of qualifying steps, beginning with technical papers and videos, then advancing to actual vehicle testing at team sites. Of the 89 teams to initially apply, 35 teams were invited to the National Qualification Event (NQE), a rigorous eight-day vehicle testing period. 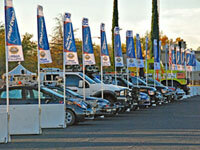 The NQE was co-located with the Final Event in Victorville, CA. DARPA transformed the roads of the former George AFB into an autonomous vehicle testing ground, laying over four miles of protective k-rail barriers in creating multiple test courses. To see videos and pictures of the event, please visit the Gallery. The NQE A test course required robots to safely merge into and out of two-way traffic in a tight, circulating course. Needless to say, this led to some hair-raising moments for some of the traffic drivers. Besides the complex timing and scoring being recorded by course officials, traffic drivers would alert officials to aggressive behavior with an ever-popular horn blast. Amazingly, in eight days of testing, only one traffic vehicle was actually struck by a robotic vehicle, a testament to the progress of the teams and DARPA’s focus on safety. The meandering NQE B course tested robots on their ability to stay within a lane as they traversed this 2.8-mile course. One section, affectionately termed “The Gauntlet” required the robots to delicately maneuver through a series of parallel parked cars and road obstacles. A final test on the NQE B course required the robots to find an assigned parking spot between adjacent parked cars, then safely pull into and back out of the spot before proceeding on its mission. NQE C was traffic intensive, consisting of a series of four-way stop intersections for the robot to negotiate, each with its own arrangement of traffic. Robots had to recognize the other vehicles at these intersections, determine the order of precedence and then safely proceed through the intersection when it was their turn. For the second half of the NQE C course, various road blocks were emplaced and the robots were tested on their ability to recognize the road block, execute a U-turn and dynamically replan a new route to complete their mission. After tallying all of the NQE scores, DARPA announced on November 1, 2007, that 11 teams would be competing in the Final Event. And so at sunrise on November 3, in front of a crowd of thousands on hand to witness history being made, Dr. Tether, DARPA Director, raised the green flag and the race was on. One by one, all 11 finalist robots were released from their starting chutes, followed by a chase vehicle equipped with an emergency stop control. The course for the final event was communicated to the teams in the form of two files, analogous to a map and a specific mission. Upon announcing the finalist selections on November 1, teams were given the ‘map’ file of the final course (Route Network Definition File). However, each team didn’t receive their Mission Definition File, which lists the order of checkpoints they had to visit, until five minutes before they launched on race day. 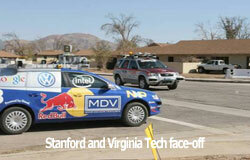 With this approach, the teams had no a priori knowledge of their missions, creating a truly autonomous driving test. Thirty manned traffic vehicles were also released onto the course to increase traffic density. This fleet of Ford Tauruses were retrofitted with safety cages, race seats, fire systems, radios and tracking systems, and were driven by professional drivers. 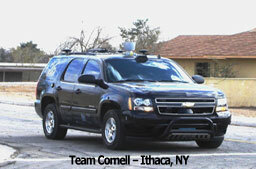 In all, over 50 vehicles, both manned and unmanned, were navigating the city streets simultaneously during the final event. DARPA staff were scattered throughout the course serving as safety officials, noting any errant or unsafe behaviors which would eventually be counted in a team’s final score. The Command Operations Center (COC) served as the central hub for all race monitoring, where DARPA staff tracked all vehicles, initiating coursewide emergency-stop commands to the robots as necessary. After strong starts by all the finalists, by mid-morning almost half of the field had been removed from the race for a variety of reasons. Terramax, a returning crowd favorite, went awry in a parking lot, and was stopped moments before entering the old commissary building. Team UCF decided to take a break and pulled off the road and into a carport before being removed from the race by officials. Despite these hiccups, six teams emerged as strong contenders as they methodically picked through their missions. Early afternoon brought the first true accident of the day when Cornell and MIT bumped sides at low speed as they tried to share a lane. The robots were separated and allowed to resume their missions. Highlight videos and pictures of the NQE and Final Event can be found in the Gallery. DARPA broadcasted the event live to the world over the internet and had a huge viewing audience in the event tent, where live footage was projected on giant screens. As the day wore on, it became apparent to all that this race was going to have finishers, and that it was going to be a close one. 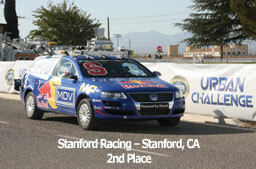 At 1:43 pm, Stanford’s entry, “Junior” crossed the finish line first with a run-time of just over four hours. 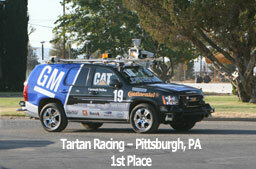 A minute later, Tartan Racing’s “Boss” crossed the finish line. It was a scene that would be repeated over and over as six robots eventually crossed the finish line, an astounding feat for the teams and proving to the world that autonomous urban driving could become a reality. 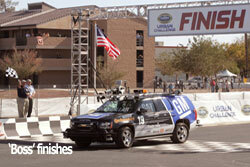 This event was not just a timed race however – robots were also being judged on their ability to follow California driving rules. DARPA officials pored through reams of data throughout the night, analyzing each team’s infractions and elapsed run times.